How Are Queer Chefs Serving the Queer Community? 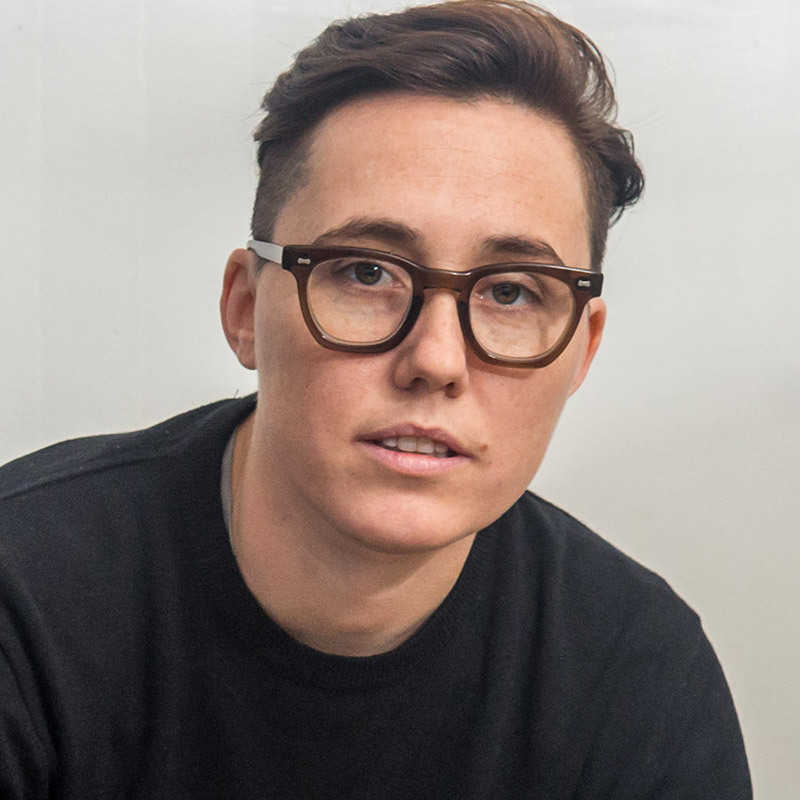 With so much involved in running a restaurant—far beyond just cooking—it can seem like a lot to ask that LGBTQ chefs also be LGBTQ leaders. But many in fact are, and for Pride month at Jarry we thought this might be a useful way to think about who and which establishments we want to support. 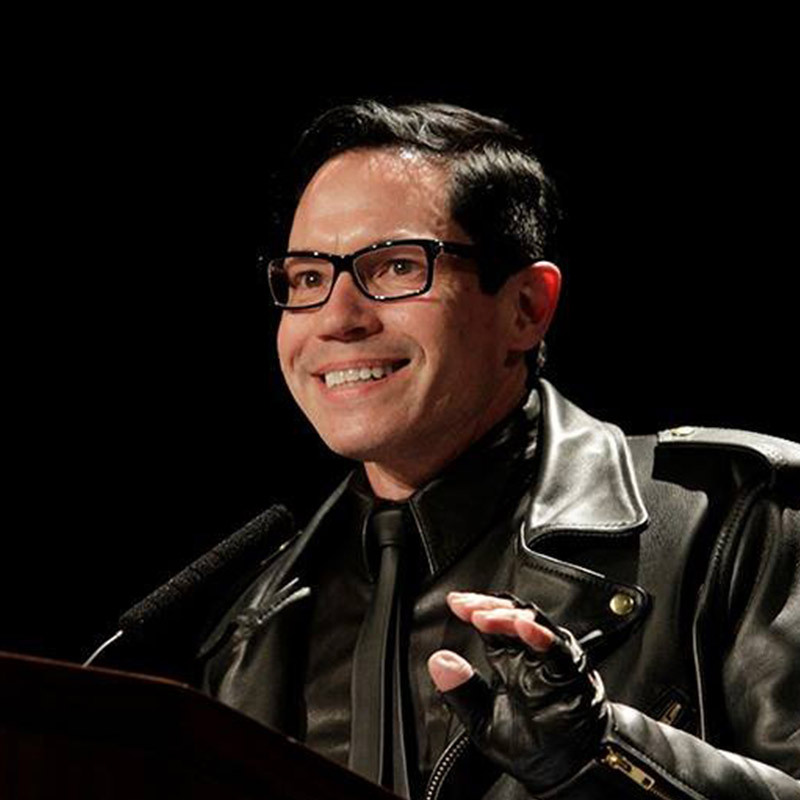 As we posed the question to nine of them—do they feel they have a responsibility to the queer community?—we’ll admit that we'd often assumed the best in terms of their capacities to act as allies and advocates. But recent controversies have led us to think more critically. 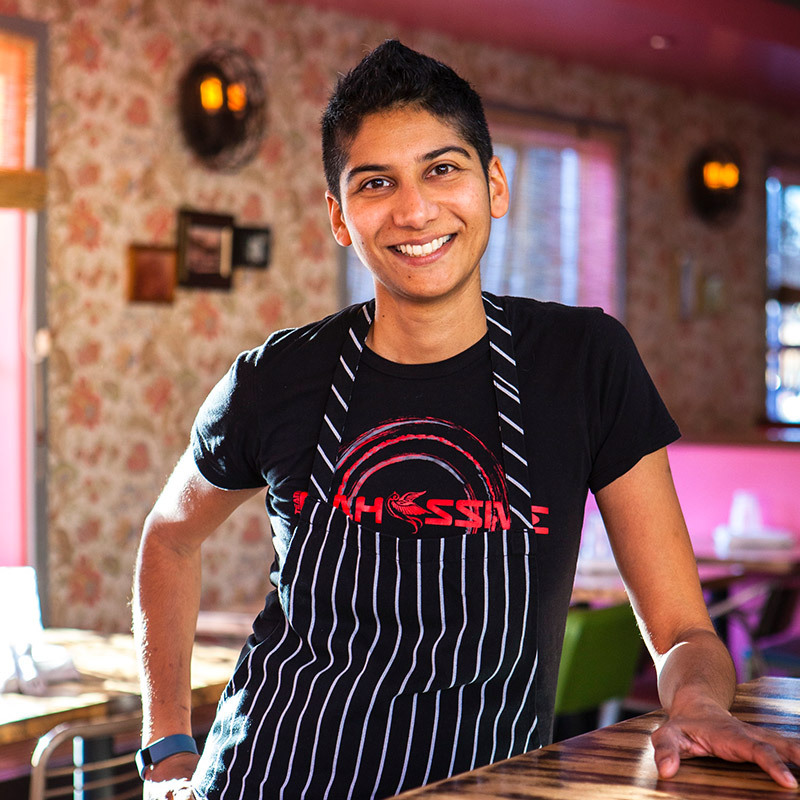 How important is it for LGBTQ chefs to make their spaces inclusive and nurturing of queer and marginalized communities? Do they have a responsibility to us? Here’s how they responded. As a child of the 60s, I grew up with very few “out” role models and a very narrow, negative view of what it meant to be gay, so I’ve always felt a strong duty to be visible in my identity. As a chef who has had some success in her career, I have the added responsibility of having a platform and of being an industry leader. But I think all human beings should be looking out for the marginalized and less fortunate, and should be standing up and doing their best not to align themselves with those who abuse their power. At Willa Jean we do our best to make sure everything we do represents and contributes to our community. This city has a history of often forgotten communities, neighborhoods, and citizens and I'd like to think WJ has become a gathering place for intersectionality. I know I don't get it all right all of the time, but I know my responsibility is to try and to be better every damn day. It is also to make WJ the most radically inclusive restaurant space in New Orleans. I do not agree with what's happening in NYC, but I'm choosing to focus my energy on being supportive to the amazing women and overlooked folks around me instead of on anger and confusion. I definitely feel a responsibility towards my LGBTQ community. As a chef, I have the privilege of feeding all walks of life, everyday. It's my job to be inclusive and to create an environment in which people—both diners and FOH/BOH staff—can feel comfortable as themselves. This industry has always been known as a safe place for "misfits.” I think we forget that sometimes and we need to be more proactive in bringing that back to light. We should be the leading example of an all-inclusive industry, especially given the current changes taking place. Being an inclusive space has always been part of my whole mission. It's all about being intentional: We’re going to make delicious food, we’re going to make every customer feel amazing, we’re going to respect each other, and we’re going to have a safe work environment. You have to have the same level of intentionality about how you cook, present food, and interact with your guests, as you do about your workspace. It’s important to own your privilege, to know that if they’re coming for other people, eventually they’re going to come for you. To just sit by and be complicit because you have more to gain . . . it’s patriarchy, it’s capitalism at its most grotesque. Inviting the larger community into MeMe’s once a month at our queer industry night, Family Meal, has been one of my favorite parts about running a restaurant. Libby [Willis, co-owner] and I have been really lucky to partner with some incredible queer people in the industry. We invite them behind our bar and into our kitchen, while raising money for causes they care about. Besides Family Meal, it’s exciting to walk into the dining room on any given day and see queer people in the seats, working in the kitchen, and behind the bar. The idea of MeMe’s came from our dinner parties—bringing people together and making them feel comfortable. From the very start, MeMe’s was never going to be a chef-driven restaurant. For us, bringing a queer identity into food means side-stepping a toxic, ego-focused work environment and choosing collaboration and community. We’re a small team, and every single person is important to our guests’ experience. What makes MeMe’s community work is how our whole team functions together. 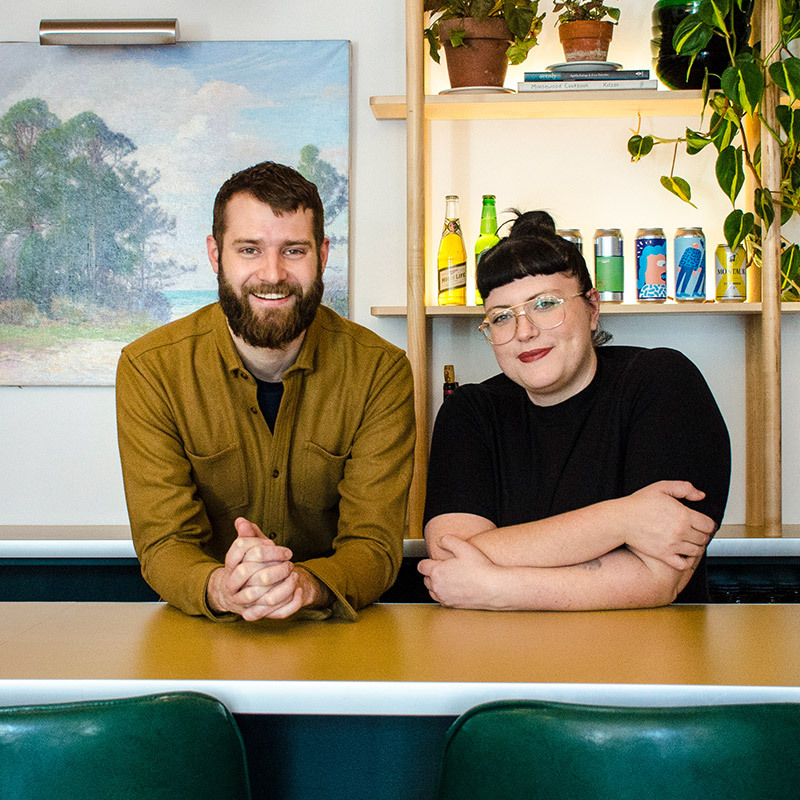 Anna [Hieronimus, co-owner of now-closed Take Root] and I have always felt that as queer business owners we have a responsibility to be visible and share our story when given the opportunity. We speak out on topics we are passionate about and refer to people more qualified when we are less in tune with an issue. We are certainly not always at the center of a conversation, or even on the fringe, but we try our best to support the work of anyone who is passionate and knowledgeable with ways to make a significant impact for the betterment of a diverse industry, and, more importantly, one that embraces open dialogue and challenges antiquated industry standards. It’s a problem that I even have to describe the food and culture that I value—the cultures that have supported me and taught me how to believe in my own value—as marginal. I work within a system that tries to convince me that I am secondary. I am fed language that refutes my own stake in history and then sells my culture back to me. 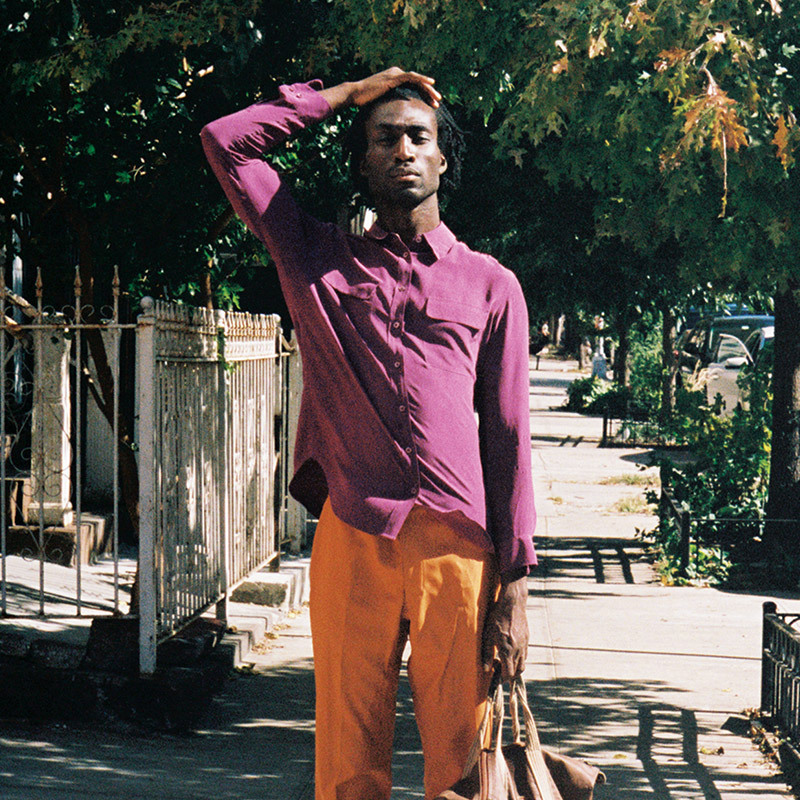 I decided to not just work in the food industry but to become a queer, black business owner. I challenge myself to be the kind of business owner I would want my younger, queer, black self to work for. I remember myself at 15 or 16 lacking the confidence and support that I have now. I feel responsible to all of the QPOC folks who never had someone to speak up for them. Cooking is never just about food. We are creating the industry standards that allow for meaningful, tangible connections. Giving back to the cultures that have sustained me and to create a work environment that goes beyond inclusion but instead allows for my peers to thrive and feel heard is what feels urgent to me right now. I’m very sensitive to my team and I feel it’s important to treat everyone with respect and dignity. In particular, marginalized and/or LGBTQ persons have historically helped each other out and banded together when needed. I’m proud of our team of both the straight and LGBTQ persons that work seamlessly together to get the job done while treating each other with respect. I think the kitchen culture is set by the leaders in the kitchen. I’ve always been openly gay and work mostly with straight men. They treat me with respect because I treat them with respect as well. They tell me that they love me and give me hugs. It's really amazing. I think younger people (that are not conservative) are so much more open minded about queer culture than ever before. I definitely feel it is my duty to create a safe and welcoming space for my teammates to excel and succeed. 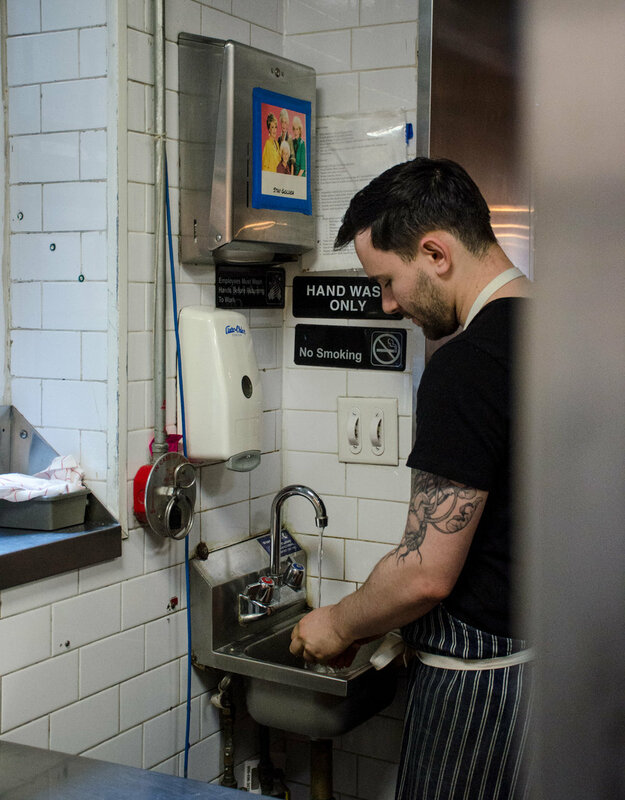 The days of testosterone-dominated kitchens are potentially fading and chefs/owners are wising up quickly that equality in the workplace is the key to success. I have always tried to create a very inclusive environment for all, knowing that visibility on all fronts is key for our LGBTQ community. Being located in a city that was once the capital of the Confederacy, it is important to me to always remain out and LGBTQ-forward in my approach to running L’Opossum. Aaron Hutcherson is a writer/editor and recipe developer based in New York City. He's a fan of comfort food, whiskey, and intersectionality. You can follow his cooking and eating adventures on Instagram and Twitter. Lukas Volger is the editorial director of Jarry. 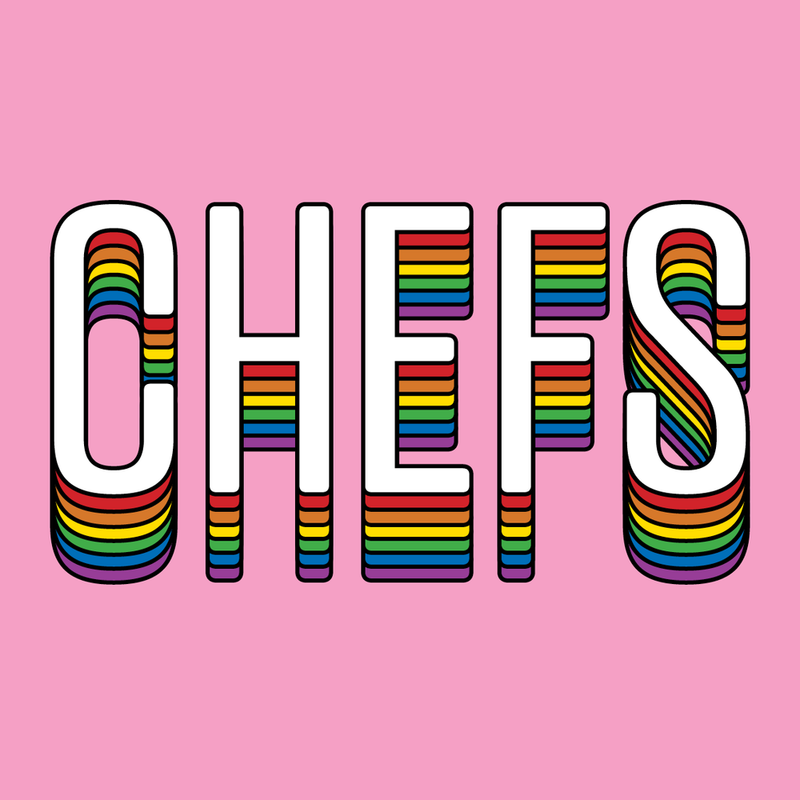 Art credits: "Chefs" graphic by Steve Viksjo inspired by the "QUEER" Instagram sticker by Andy Simmonds, Anita Lo courtesy the chef, Kelly Fields by Gabrielle Geiselman, Jeremy Salamon by Steve Viksjo for Jarry, Preeti Mistry by Sierra Prescott, Bill Clark and Libby Willis by Steve Viksjo for Jarry, Elise Kornack courtesy the chef, DeVonn Francis by Rob Truglia for Jarry, Steven Satterfield by Heidi Geldhauser, Danny Alas and Justin Rodriguez by Colleen Connor, David Shannon courtesy the chef. Nodding toward the photo of Julia Child and James Beard that’s tacked over the door out to the dining room, Chef Jeremy Salamon issues a prayer to his “food gods” each night before service. It’s just a quick moment of intention, an expressed hope that all goes well. The origin of this habit has little to do with communication glitches, swapped orders, equipment breaking down, or anything that happens in the dining room. Instead it comes from a past job in the kitchen of a large, celebrated New York restaurant where, as a line cook, one of the hazards he dealt with was a fellow cook who’d flick oil from the deep fryer at whomever caught his ire. That’s when he started praying to the food gods—that he wouldn’t go home with third-degree burns. While he no longer contends with hot oil flying at him, the nightly prayer has stuck. this is how you have to act." 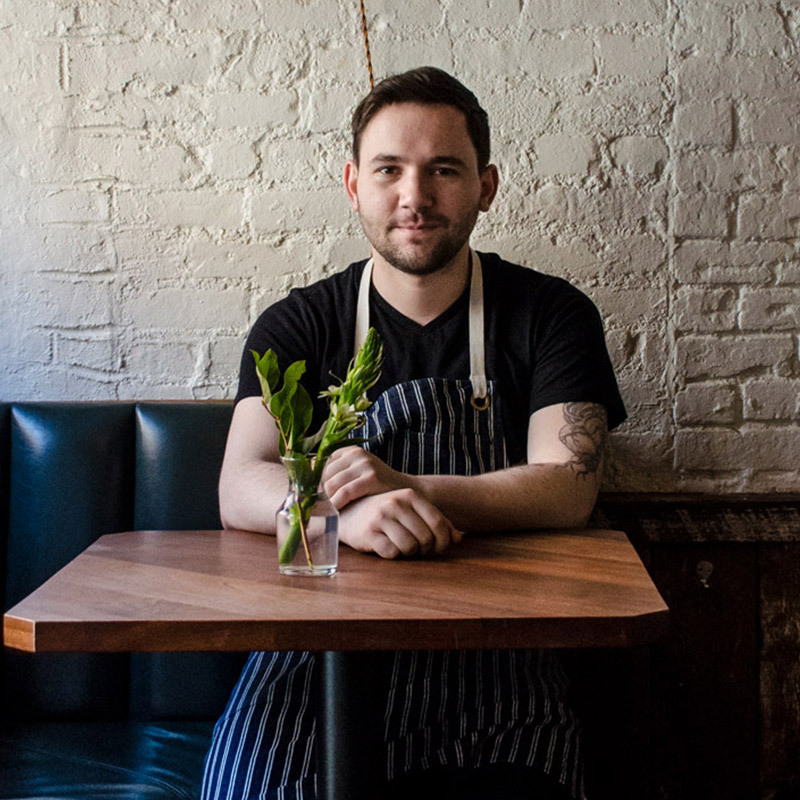 Jeremy is the recently appointed executive chef at The Eddy, a 38-seat restaurant in Manhattan’s East Village. Open since 2014, its original incarnation was as a refined neighborhood restaurant serving a Catskills-influenced take on New American cuisine. 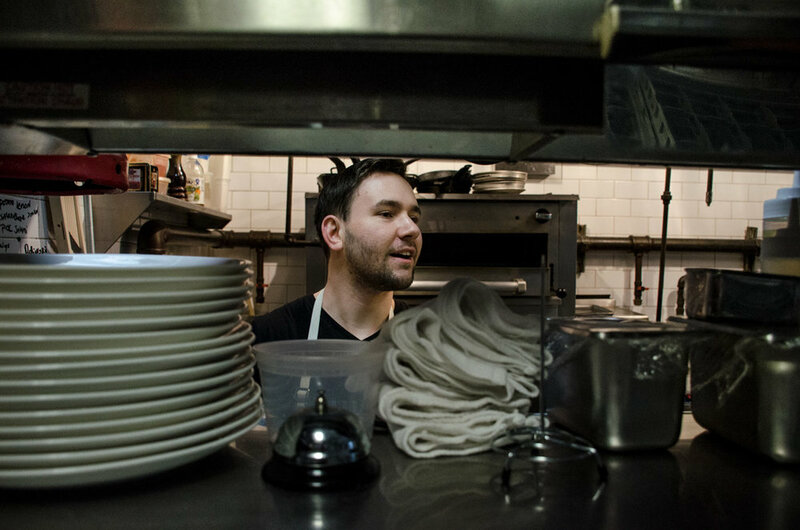 For two years, Jeremy worked as The Eddy’s sous chef (and before that, had stints in several other New York kitchens, including the queer-captained Prune and Buvette) before leaving the job to visit family in Hungary and explore other parts of Eastern Europe. Upon returning home to New York, he threw a series of popup dinners inspired by his travels, and when the chef position at The Eddy opened up, the success of—and enthusiasm for—those pop-ups led to a job offer. At The Eddy, Jeremy is ushering in a revamped menu that dynamically alters the restaurant’s DNA. His research in Hungary infuses his local-seasonal menu with flavors and dishes of what he ate there. Part of his mission is to challenge diners’ notions of Hungarian food, going beyond borscht, paprikash, and “lots of meat and fried things.” For him, Hungarian food conjures a landscape with fields of berries and stone-fruit groves, wines made from nuts and plums, a widespread culture of living off one’s own land, and a rich and exciting pastry tradition. It’s no surprise that it’s a much different and more vibrant cuisine than most Westerners’ perceptions of it. One of the most popular items he’s introduced is langós, a Hungarian, pancake-sized flatbread that’s deep-fried until golden and crisp on the exterior, while flaky and yielding inside. He serves them with a changing cast of accompaniments, like soft fresh cheeses, preserves, smoked meats, or pickled herring. Pork schnitzel is on the menu, too, served with huckleberry preserves and a potato salad threaded with dill; goulash appears as one made with beef cheeks. “We didn’t want to be a Hungarian restaurant,” Jeremy said, but he won’t rule out the idea entirely. Such dishes are balanced by what Jeremy describes as modern American and French-influenced fare, tethered always to what he can source at the local farmers market. These modern American dishes take shape, most memorably, as vibrant vegetable dishes, like his boiled, then char-grilled, beets that are smashed and marinated for two days in a mix of honey and sherry vinegar, or an ethereal beer-braised kabocha, served with maple sabayon and fried shallots. Olive oil-poached scallops are soft as butter, served with charred scallion and Meyer lemon. Jason Soloway, the owner of The Eddy and its sister restaurant Wallflower, says that when he steps back to evaluate what’s going on in restaurants in New York and, generally, across the United States, he sees a “contraction into what’s safe and what’s well-known” for neighborhood spots like his. There’s an explosion of fast-casual chains serving comfort food on one end, and on the other, fine dining restaurants that open at hotels, where the financial cushion allows a buffer for serving more challenging fare. This leaves “the middle,” as Jason describes it, often catering to the lowest common denominator in order to stay afloat: pasta, bistros, burgers. So it can be a gamble to offer a menu that doesn’t fall directly in line with the familiar formulas, but right now The Eddy is eager and willing to invest in Jeremy’s vision. Jeremy’s “deep personal connection to each dish that he makes” excites Jason, and he’s emphatic in his confidence in Jeremy’s talent and passion. But a balancing act is necessary. “We want to embrace what Jeremy’s bringing to the table, we want that to translate to as many people as possible, but we also want people to be happy”—and to return often. Jeremy’s up for the challenge. As he continues to tweak and finesse—he’ll unveil the spring menu at the end of April—he works hard to keep pace with the learning curve of the role. Much of the minutiae of running a small restaurant requires skill sets fully separate of cooking: from being the resident painter, plumber, and repairman, to building a team and figuring out what kind of leader he wants to be. “I think I lead quietly,” he said, “by example, but also by over-communicating.” This may sound like a contradiction, but by communication Jeremy means relationships rather than transactions. 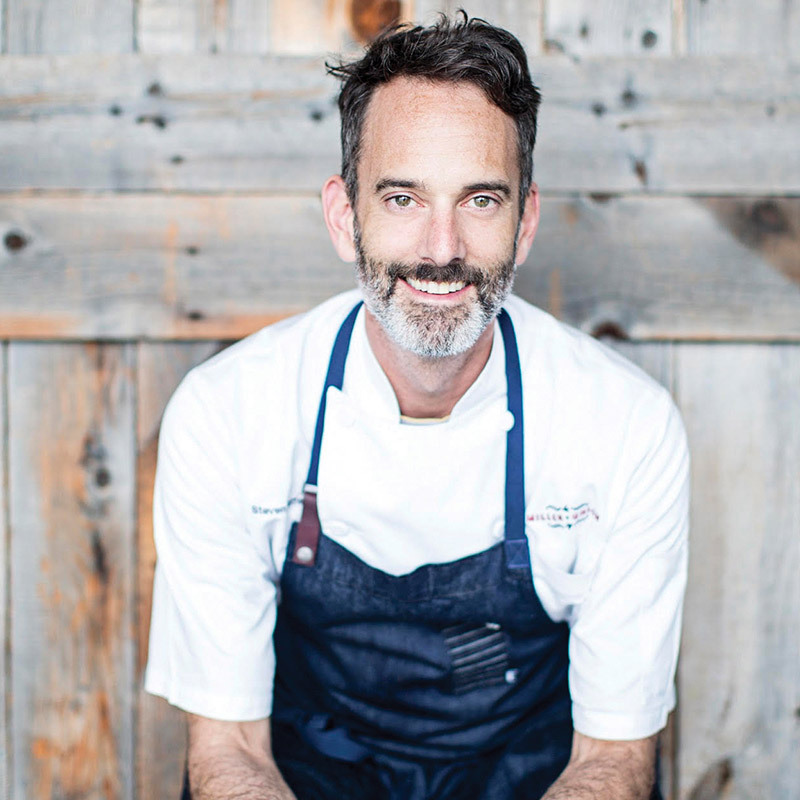 Even if part of the learning curve in the industry has been finding out that kindness doesn’t always achieve the desired result, he believes in using it to reshape the ecosystem of the kitchen. “When you work in a big restaurant group, 50 people on the line, no one gives two shits about your day,” he said. And so one practice, simple as it may sound, is just checking in regularly, ensuring that the connections formed in the kitchen are meaningful ones. The Eddy is located at 342 East 6th Street in New York City. For more information and to view their current menus, visit their website.